Active radar homing (ARH) is a missile guidance method in which a missile contains a radar transceiver (in contrast to semi-active radar homing, which uses only a receiver) and the electronics necessary for it to find and track its target autonomously. NATO brevity code for an air-to-air active radar homing missile launch is Fox Three. Because the missile is tracking the target, and the missile is typically going to be much closer to the target than the launching platform during the terminal phase, the tracking can be much more accurate and also have better resistance to ECM. Active radar homing missiles have some of the best kill probabilities, along with missiles employing track-via-missile guidance. Because the missile is totally autonomous during the terminal phase, the launch platform does not need to have its radar enabled at all during this phase, and in the case of a mobile launching platform like an aircraft, can actually exit the scene or undertake other actions while the missile homes in on its target. This is often referred to as fire-and-forget capability and is a great advantage that modern air-to-air missiles have over their predecessors. Many missiles employing this type of guidance have an extra trick up their sleeves; If the target does attempt to use noise jamming, they can in effect turn into an anti-radiation missile and home in on the target's radiation passively (home-on-jam). This makes such missiles practically immune to noise jamming. Active radar homing is rarely employed as the only guidance method of a missile. It is most often used during the terminal phase of the engagement, mainly because since the radar transceiver has to be small enough to fit inside a missile and has to be powered from batteries, therefore having a relatively low ERP, its range is limited. To overcome this, most such missiles use a combination of command guidance with an inertial navigation system (INS) in order to fly from the launch point until the target is close enough to be detected and tracked by the missile. The missile therefore requires guidance updates via a datalink from the launching platform up until this point, in case the target is maneuvering, otherwise the missile may get to the projected interception point and find that the target is not there. Sometimes the launching platform (especially if it is an aircraft) may be in danger while continuing to guide the missile in this way until it 'goes active'; In this case it may turn around and leave it to luck that the target ends up in the projected "acquisition basket" when the missile goes active. It is possible for a system other than the launching platform to provide guidance to the missile before it switches its radar on; This may be other, similar fighter aircraft or perhaps an AWACS. Most anti-ship missiles use active radar homing for terminal guidance. Many ARH missiles with targets on land or sea use millimeter wave guidance. 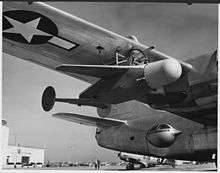 The U.S. Navy's Bat radar-guided glide bomb of World War II, world's earliest munition design known to use an active radar homing system.